Digitask provides UNIX, Linux and OpenVMS systems integration and management, clustering, software development, storage area networks (SAN), network design and database administration for customers who demand highly-available, mission-critical systems. “Our strategy is to align with systems integration organizations that have strong OpenVMS skills that address our customers' high availability requirements. Digitask’s long-standing reputation for cluster expertise enables broader technical consulting services in this area." Richard Marcello, former Vice President Business Critical Systems of the Hewlett-Packard Corporation. 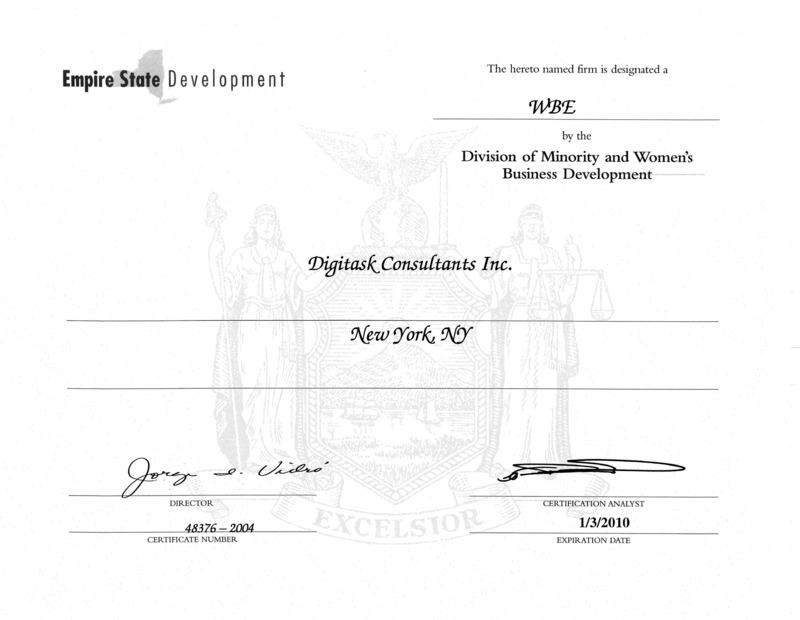 Digitask is certified as a Woman-owned Business Enterprise by the Empire State Development Corporation and the New York City Department of Small Business Services. Digitask is an authorized and certified reseller for Hewlett-Packard, SUN, Dell and VMWare.